Annamari tells me that Anton has started shopping for a pram. And Andrew is going to start looking soon too, I believe. 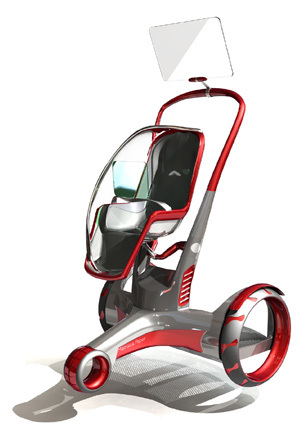 Stroller design has come a long way, so look out, I’m sure we’ll see some posts going up! How about this one, guys? It’s a man pram, I found it on mamasandpapas.com. Is that an iPad? Next we’ll be opening a creche here at GREENinc. The thing about buildings is that they’re usually so … immovable. But not this one that Anton posted on Facebook. I love the way it can pop up anywhere, it gives it an element of surprise and playfulness. James posted this watering can, so we don’t stray too far from the landscape theme. I really enjoyed this video clip by Natalie Jeremijenko. She says that we have created unhealthy environments for ourselves, and for the creatures that share them with us, so she’s set up a clinic to treat them. The environments, that is. We tend to forget that we share our spaces, even our apartments. Natalie presents some of her experiments and interventions. And from nature pervading our cities, check out this installation of a city transported into nature. A finally, a wine cellar annexe in France that sits beautifully comfortably with its surroundings, built and natural.